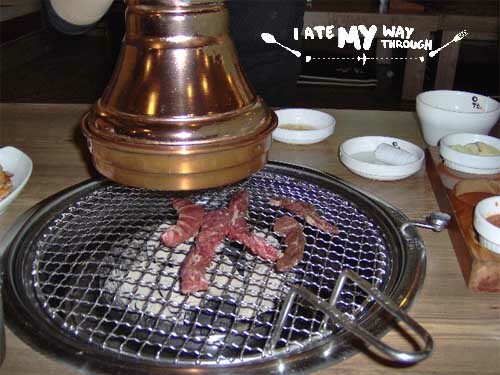 The Korean barbecue, kalbi or galbi, is an extremely fun way to enjoy an evening. Built-in grills with extractors are fixed on each table, and plates of raw meat are cut up with scissors and cooked by the diners, who sit on cushions on the floor at sunken tables. Numerous side dishes which can include garlic, bean paste, shrimps, bean sprouts, and of course the ubiquitous kimchi (traditional Korean dish of pickled vegetables, commonly cabbage) are replenished for free as many times as desired. Do as the Koreans do and wrap various ingredients into a lettuce leaf and eat. In most restaurants diners can ask for refills by pressing a bell on the table, however this is less common in eateries outside of South Korea. Desserts are not usual, however if still hungry it is common to order cold noodle soup as a dessert. Accompany the meal with soju, a national alcoholic drink similar to vodka. Travel tip: Korea has a 24 hour travel information line with assistance in English, Chinese and Japanese – in Korea dial 1330 and from abroad +82 2 1330. This barbecue restaurant is situated 30 km south of Seoul and is loved by the locals, no doubt attracted by its cheap prices. Suwon is renowned for the Suwon kalbi marinated beef short ribs which are especially good, and set menus make this a very affordable option only a 30 minute train ride from the capital. Obaltan has branches throughout Seoul and their range of meats is adventurous to say the least. The usual fare of marbled beef and pork is available, but diners can also barbecue ox intestines if they wish. Grilling this organ is not for the faint-hearted as its fatty content means juice pops out whilst being cooked. Less squeamish visitors can try the ox stomach wall cleverly disguised amongst liberal amounts of fried rice. Seoul Jung offers the possibility of cooking at your table in luxurious surroundings. Owned by Korean Airlines and situated in the plush Wilshire Grand, both the presentation and the delicious flavours are rather special here. Choose from seafood barbecue options with lobster, scallops and squid, or thinly sliced pork belly and beef tongue for the more adventurous. The dishes are priced between US$25 – $40, but this includes all the side dishes. Boasting their own little ‘Korea Town’ it’s no wonder there’s no shortage of Korean barbecue restaurants in Toronto. The Korean Grill House is especially popular thanks to its all-you-can- eat menus available at lunchtimes or after 10pm. At only $14 (Canadian dollars) per person for pork, beef, chicken, ribs, ox tongue, ox liver, salmon, squid and fish fillet it’s impossible to go wrong. Ran is a little more expensive than some of the other Korean eateries in London, however the varied menu containing bibimbap (bowl of rice topped with vegetables or meats), kimchi pancakes, and bulgogi (marinated meats for barbecuing) more than makes up for it. Not every table has a built-in grill, so staff will at times use portable barbecues to grill the food. Ran is one of the most popular Korean restaurants in London, therefore booking is advisable, especially at weekends.